This form is a long term hotel operator management agreement for a large hotel with a major hospitality flag. The agreement appoints the hotel operator and details its management responsibilities for the property. The agreement contains carefully drafted definitions for base management fee, incentive management fee, gross revenues, available cash flow and the like. The agreement contains specific requirements for the hotel operator concerning accounting, bookkeeping, working capital and bank accounts. The agreement also imposes duties upon the hotel manager with respect to Sarbanes Oxley certifications. THIS MANAGEMENT AGREEMENT (“Agreement”) is made as of the ____ day of ____, 20__ (“Effective Date”) by the party identified as the “Owner” in Schedule 1 attached hereto (“ Owner ”), and the party identified as the “Manager” in Schedule 1 attached hereto (“ Manager ”). A. Owner desires to engage Manager to manage and operate the hereinafter described hotel, and Manager desires to accept such engagement, upon the terms and conditions set forth in this Agreement. B. All capitalized terms used in this Agreement shall have the meaning set forth in Section 12.01 hereof. Owner hereby appoints and employs Manager as Owner’s exclusive independent contractor to supervise, direct and control the management and operation of the Hotel throughout the Term. Manager accepts such appointment and agrees to manage the Hotel during the Term in accordance with the terms and conditions of this Agreement. 1.02. Management of the Hotel. 1. Recruit, employ, supervise, direct and discharge the employees at the Hotel (either itself or through an Affiliate of Manager provided nothing contained herein shall relieve Manager of its obligations to fully perform hereunder) and maintain adequate staff, consistent with Prudent Industry Practices, to carry out its duties under this Agreement. 2. Establish prices, rates and charges for services provided in the Hotel, including Guest Room rates, subject to Owner’s prior approval, which approval shall not be unreasonably withheld and further which prior approval shall not be required where the local market conditions are particularly volatile. Notwithstanding the foregoing, Owner reserves the right at any time and from time to time to require prior approval of pricing changes. 3. Establish and revise, as necessary and in accordance with Prudent Industry Practices, administrative policies and procedures, including policies and procedure for the control of revenue and expenditures, for the purchasing of supplies and services, for the control of credit and for the scheduling of maintenance, and verify that the foregoing procedures are operating in a sound manner. 4. Make payments on accounts payable and collect accounts receivable. 5. Procure (for Owner) all Inventories and replace Fixed Asset Supplies. 6. Prepare and deliver interim accountings, annual accountings, Annual Operating Statements, Building Estimates, Repairs and Equipment Estimates and such other information as is required by this Agreement. 7. Plan, execute and supervise repairs and maintenance at the Hotel. 8. Obtain the insurance required to be obtained by Manager pursuant to Article VI of this Agreement and provide or cause to be provided all risk management services related thereto, subject to the provisions of Section 6.05. 9. Obtain and keep in full force and effect, either in its own name or in Owner’s or Owner’s affiliate’s name, as may be required by applicable law, any and all licenses (including, without limitation, liquor licenses which shall be maintained in the name of Manager to the extent permitted by law) and permits to the extent same is within the control of Manager (or, if same is not within the control of Manager, Manager shall use all due diligence and best efforts to obtain and keep same in full force and effect). 10. Subject to the terms of this Agreement, execute subordination agreements, estoppel certificates and other documentation required by any purchaser or mortgagee and reasonably cooperate (provided that Manager shall not be obligated to enter into any amendments of this Agreement) with Owner or Landlord in any attempt(s) by Owner or Landlord to effectuate a Sale of the Hotel or to obtain a Mortgage. 11. At the direction and with the concurrence of Owner, arrange for and supervise public relations and advertising and prepare marketing plans. 12. Manage and operate the Hotel at all times in compliance with the Franchise Agreement, including (without limitation) the Manual and the System standards (as such terms are defined therein). B. The operation of the Hotel shall be under the exclusive supervision and control of Manager, except as otherwise specifically provided in this Agreement, and Manager shall be responsible for the proper and efficient operation of the Hotel. 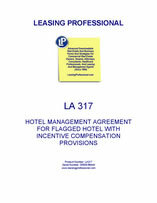 In fulfilling its obligations under this Agreement, Manager will act as a reasonable, prudent operator of the Hotel, having regard for the status of the Hotel, operating the Hotel in accordance with Prudent Industry Practices and at all times maintaining and complying with all standards imposed by the Franchise Agreement, and subject to the foregoing and all other terms and conditions of this Agreement, shall have discretion in the following: charges, terms and conditions for Guest Rooms and commercial space; credit policies and services provided by the Hotel; food and beverage services; employment policies; granting of leases, subleases, licenses and concessions for shops and businesses within the Hotel, provided that the term of any such lease, sublease, license or concession shall not exceed the lesser of one (1) year or the Term without the prior written approval of Owner; receipt, holding and disbursement of funds; maintenance of bank accounts; procurement of Inventories, supplies and services; promotion and publicity; payment of costs and expenses as are specifically provided for in this Agreement or are otherwise reasonably necessary for the proper and efficient operation of the Hotel; and, generally, all activities necessary for operation of the Hotel. With respect to all Material Management Decisions, Manager shall consult with Owner in advance of making any such decisions. The term “Material Management Decisions” means a decision to be made in connection with any expenditure of more than $10,000 for each item or $50,000 in the aggregate for all such items in any Fiscal Year if such expenditure is not included in the approved Annual Operating Projection for such Fiscal Year or if such expenditure would result in an increase in the overall Annual Operating Projection. C. Manager shall comply with and abide by all applicable Legal Requirements pertaining to its operation of the Hotel. Any of Landlord, Owner or Manager shall have the right, but not the obligation, in its reasonable discretion, to contest or oppose, by appropriate proceedings, any such Legal Requirements. The reasonable expenses of any such contest of a Legal Requirement shall be paid from Gross Revenues as Deductions. All personnel employed at the Hotel shall at all times be the employees of Manager and not the employees of Owner. Manager shall have reasonable discretion with respect to all personnel employed at the Hotel, including, without limitation, decisions regarding hiring, promoting, transferring, compensating, supervising, terminating, directing and training all employees at the Hotel, and, generally, establishing and maintaining all policies relating to employment; provided, however, that (i) Owner shall have the right to approve the hiring or termination of the persons who occupy the position of General Manager for the Hotel and (ii) Manager shall not negotiate or enter into any collective bargaining or other labor agreement with employees or with any organization representing or claiming to represent employees without Owner’s prior consent. No person shall be given gratuitous accommodations or services without prior joint approval of Owner and Manager except in accordance with policies agreed upon by Owner and Manager. Notwithstanding the immediately preceding sentence, employees of Manager shall be entitled to up to five nights at the Hotel during any 12-month period without charge on a space available basis; provided, however, Owner reserves the right to discontinue these complimentary stay privileges if Owner determines that such stays are overburdening the Hotel or the business conducted therein. Manager shall reimburse Owner for the costs (including relocation costs) of hiring and training General Managers who are employed at the Hotel for less than one (1) year and are transferred or relocated other than to a hotel owned by Owner or its Affiliates. Manager shall be solely responsible and liable for all acts or omissions of the personnel employed at the Hotel and all persons managing such employees, and Manager shall indemnify, defend and hold Owner harmless from any and all claims, damages, liabilities, obligations and costs (including reasonable attorneys’ fees) arising therefrom, including (without limitation) all claims, damages, liabilities, obligations and costs arising from the negligence, fraud, theft and willful misconduct of Manager’s employees and from employment discrimination, wrongful termination, violations of law and other claims asserted by such employees, except to the extent of any costs properly payable from Gross Revenues as Deductions. 1.04. Owner’s Right to Inspect. Owner, its representatives, employees, agents, Affiliates and Mortgagees shall have access to the Hotel at any and all reasonable times for the purpose of inspection, exercising any of its rights under this Agreement or showing the Hotel to prospective purchasers, tenants or Mortgagees and at any time in case of an emergency. At Owner’s request, Owner and Manager shall have meetings at the Hotel and at mutually convenient times. Manager shall be represented at such meetings by the General Manager of the Hotel and such other personnel as the Manager and/or Owner may deem appropriate. The purpose of the meetings shall be, inter alia, to discuss the performance of the Hotel and other related issues, including any variations from the Annual Operating Projection. Subject to the availability of adequate funds, Manager shall take such actions consistent with this Agreement as are necessary for the Hotel to comply with the System Standards, and Manager shall operate the Hotel so that the Hotel will at all times comply with System Standards.